As your cat gets holder, he’s going to start slowing down. He may not be as active as he used to be, or as interested in playing games. In addition to his changing activity level, your cat’s nutrition needs will change a little bit once he becomes a senior. With his reduced activity, he’ll need fewer calories, but he still needs plenty of high-quality protein. He also needs healthy fat to support his skin and coat as well as antioxidants and essential vitamins and minerals. When it comes to cat food for older cats, you want to look for a product that is easy to digest, rich in protein, and fortified with essential fatty acids, vitamins, and minerals. You may also want to consider switching to a wet cat food formula if your senior cat has trouble chewing dry food. To help you choose the best cat food for your senior cat, check out our top 10 favorites below. The Canidae PURE line of products is made only with the highest quality ingredients and a limited number of them to reduce the risk for food allergies and sensitivities. This Canidae Grain-Free PURE Meadow Senior Cat Food is particularly designed for senior cats who have lower needs for energy and who have more sensitive digestion systems. This formula features fresh chicken as the main ingredient with grain-free carbohydrates like lentils and chickpeas. Overall, this Canidae Grain-Free PURE Meadow Senior Cat Food is full of flavor and healthy ingredients. It offers a blend of essential fatty acids from nutritious sources like chicken fat as well as plenty of dietary fiber. This recipe is fortified with chelated minerals to ensure optimal absorption as well as dried fermentation products for probiotic support. This Blue Buffalo Freedom Grain-Free Indoor Mature Recipe Wet Food is uniquely designed to be nutritious and highly digestible for senior cats. Not only is it rich in animal protein, but it is completely grain-free and full of fiber for healthy digestion. Fresh chicken is the first ingredient in this formula with chicken broth for moisture and chicken liver for extra protein and healthy nutrients. Flaxseed provides essential fatty acids and fresh vegetables offer natural sources for key nutrients as well as fiber. Made only with natural ingredients, this Blue Buffalo Freedom Grain-Free Indoor Mature Recipe Wet Food is completely free from corn, wheat, and soy ingredients as well as artificial additives and fillers. It is formulated to provide complete and balanced nutrition specific to your senior cat’s needs with no dangerous or unhealthy ingredients. Simply put, it’s full of flavor and healthy nutrients. Designed for both indoor and outdoor senior cats, this Merrick Purrfect Bistro Healthy Senior Recipe Cat Food is a protein-rich formula that is also 100% grain-free. It features fresh deboned chicken as the first ingredient with concentrated chicken and turkey meal for additional protein. Dried potato and peas provide fiber as well as essential nutrients while still being easy for your cat to digest. This recipe is also fortified with essential vitamins, minerals, and antioxidants to ensure complete and balanced nutrition. This Merrick Purrfect Bistro Healthy Senior Recipe Cat Food is made only with natural ingredients – it is free from artificial additives like colors, flavors, and preservatives. It is loaded with natural meat flavor and contains nearly 39% protein to support your cat’s lean muscle mass. This recipe contains a blend of healthy fats for skin and coat without going overboard on calories and it is balanced for omega-3 and omega-6 fatty acids as well. 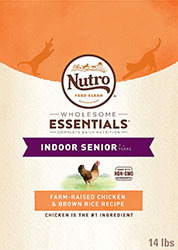 Nutro Wholesome Essentials Indoor Senior Cat Food comes in two flavors – chicken and brown rice or white fish and brown rice. Both recipes feature high-quality animal protein as the main ingredient with whole-grain brown rice for carbohydrates and fiber. Both recipes are fortified with antioxidants for healthy immunity and essential nutrients like taurine for heart health in senior cats. Nutro Wholesome Essentials Indoor Senior Cat Food contains nutrient-rich chicken fat for healthy skin and coat with fish oil for omega fatty acids. Both recipes are supplemented with chelated minerals to ensure optimal nutrient absorption and Nutro’s Fiberblend Formula to prevent hairballs. Each of these recipes is uniquely designed to support the total health and wellness of older cats and the plethora of natural ingredients ensures unbeatable natural flavor. Both recipes contain 36% crude protein with 17% fat and 6% fiber. This Blue Buffalo Wilderness Mature Grain-Free Wet Food is just one example of the products in this line, but it is the only senior-specific wet food recipe currently available. This formula was inspired by the diet of the wild lynx and, as such, is loaded with healthy protein and other natural ingredients. Fresh chicken is the first ingredient with chicken broth for moisture and chicken liver for supplemental protein and essential nutrients. This Blue Buffalo Wilderness Mature Grain-Free Wet Food recipe contains no gluten, grains, or by-products, and it is completely free from artificial additives. Flaxseed and potatoes provide dietary fiber for healthy digestion and chelated minerals ensure optimal nutrient absorption. This formula is fortified with taurine for healthy heart and vision and other essential vitamins and minerals for nutritional balance. All in all, this is a protein-packed and flavor-rich recipe that is perfect for senior cats. This Wellness Complete Health Senior Cat Food formula is specifically designed to support the nutrition of older cats. It features deboned chicken and concentrated chicken meal as the primary sources of protein with rice and barley for carbohydrate support. This recipe is fortified with essential vitamins and minerals for a healthy immune system and it contains Wellness’ WellFlex system for hip and joint support. Plus, with plenty of healthy fiber, it is great for your cat’s digestion. This Wellness Complete Health Senior Cat Food is loaded with natural flavor, but it is free from artificial additives and byproducts. It contains cranberries for urinary health, chelated minerals for maximum nutrient absorption, and probiotics for healthy digestion. Plus, it is packed with protein at 38% with 13% crude fat and 4.5% fiber. It also contains ingredients to support healthy skin and coat, strong vision, steady energy, and healthy teeth and gums. Halo is a holistic brand of pet food designed to nourish your cat’s body from the inside out with the healthiest ingredients available. This Halo Grain-Free Senior Wet Food Chicken & Chickpea Recipe is a great choice for older cats because it is rich in protein and nutrients but low in fat. High-quality protein comes from fresh chicken with chicken liver for added protein and essential nutrients. Chicken broth provides moisture and natural flavor to complement the flavors of sweet potato, chickpeas, cranberries, and blueberries. This Halo Grain-Free Senior Wet Food Chicken & Chickpea Recipe is completely free from gluten, grains, and artificial additives. It contains chelated minerals for optimal absorption and plenty of fiber for healthy digestion. Green mussels provide a supplemental source of glucosamine and chondroitin for joint support and taurine is included for healthy heart and vision. As a wet food formula, this recipe is also easy for older cats to chew and digest, plus it helps to keep your cat hydrated. The BLUE line of products features natural ingredients including real meat and garden veggies – they also contain Blue Buffalo’s exclusive LifeSource Bits which contain a proprietary blend of vitamins, minerals, and antioxidants for prime nutritional balance. 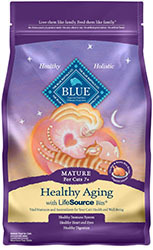 This Blue Buffalo Healthy Aging Mature Dry Cat Food recipe is a great choice for older cats because it is rich in high-quality animal protein, fortified with wholesome grains and veggies, and highly digestible for sensitive digestive systems. This Blue Buffalo Healthy Aging Mature Dry Cat Food recipe features fresh deboned chicken as the first ingredient with concentrated chicken meal for additional protein. Brown rice is the primary source of carbohydrate and it is a nutritious and highly digestible choice for cats. Chicken fat provides essential fatty acids as well as important nutrients while menhaden fish meal and flaxseed work together to ensure a balance of omega-3 and omega-6 fatty acids. This recipe is also supplemented with taurine for healthy vision and heart, with chelated minerals for optimal nutrient absorption. Made with all-natural ingredients and designed to support your older cat’s nutritional needs, this Nutro Natural Choice Soft Loaf Senior Cat Food is an excellent choice. The soft texture is easy to chew but the formula itself is still rich in high-quality animal proteins, digestible carbohydrates, and healthy fats. This recipe features fresh chicken and chicken liver as the top two ingredients with chicken broth for moisture and added flavor. Fish oil provides omega fatty acids for healthy skin and coat while chelated minerals ensure nutritional balance. This Nutro Natural Choice Soft Loaf Senior Cat Food provides 12% crude protein, 5% crude fat, and 1% fiber for healthy digestion. It is completely free from gluten and grains, and it doesn’t contain any artificial colors, flavors, or preservatives. The high protein content supports your cat’s lean muscle mass while moderate fat content provides energy without an excess of calories. Uniquely formulated to meet your aging cat’s needs for energy and nutrition, this Solid Gold Furrever Young Senior Cat Food will help your cat feel young again. It features meat-rich turkey as a lean source of protein as well as concentrated turkey meal, chicken meal, and ocean fish meal. Chicken fat provides essential fatty acids as well as other key nutrients and it is supplemented by flaxseed, salmon oil, almond oil, and sesame oil. Overall, this Solid Gold Furrever Young Senior Cat Food provides a whopping 33% crude protein with 12% fat and 4.5% fiber. The high protein content will help your cat maintain his lean muscle mass while grain-free carbohydrates like potatoes, peas, and chickpeas provide dietary fiber to support healthy digestion. This recipe is supplemented with chelated minerals for maximum nutrient absorption as well as dried fermentation products for probiotic support. Though he may not be as active as he once was, your senior cat is still your devoted friend and companion. Many cats live well past the age of 10, often reaching the age of 15 or even 20 years. The quality of your cat’s diet is one of the biggest factors that influences his lifespan. This means you need to take the time to learn about your senior cat’s nutritional needs and choose a commercial cat food product that meets those needs. In addition to knowing what you DO want to see on a high-quality senior cat food bag, you should also know what you DON’T want to see. You don’t want to see a long list of unhealthy ingredients like artificial flavors, colors, and preservatives. Avoid products made with corn, wheat, and soy ingredients because they provide very little in the way of nutritional value for cats and they come with a high risk for triggering food allergies or sensitivities. Now, let’s take a closer look at some of the hallmarks of a high-quality senior cat food. All cats require a protein-rich diet and the majority of that protein should come from animal sources like meat, poultry, and fish. Cats are obligate carnivores which means that their bodies are biologically adapted to deriving nutrition from animal products more than plant products. High-quality animal proteins should be the backbone of your cat’s diet. While protein is the main concern, your cat does need some carbohydrates for fiber and essential nutrients. Those carbohydrates need to be digestive, however, which means that they should either be whole grains (for cats not sensitive to grains) or grain-free alternatives like sweet potatoes, chickpeas, or other legumes. Fat is the most highly concentrated source of energy for your cat and he needs a blend of essential fatty acids for healthy skin and coat. Again, it is best if this nutrient comes from animal sources (like chicken fat or salmon oil), but a blend of animal and plant fats is acceptable as well. Although the majority of your cat’s diet should come from animal-based ingredients, fresh fruits and vegetables (in moderate amounts) can provide natural sources of key vitamins and minerals. Natural sources are always more biologically valuable for your cat than synthetic vitamins and minerals. In order to make any cat food product nutritionally complete, pet food manufacturers must add synthetic vitamins and minerals as well as other supplements. Chelated minerals are minerals that have been chemically bonded to protein molecules which makes them easier for your cat’s body to absorb. Dried fermentation products are probiotics that support your cat’s healthy digestion. If you choose a cat food that meets these five requirements, you can rest easy knowing that your senior cat’s nutritional needs are being met. Because every product is unique, you’ll need to pay attention to the feeding guidelines on the package and determine how much is appropriate to feed your cat based on his weight and age. Keep in mind that these are suggestions – you need to keep an eye on your cat’s weight and activity level to make sure you’re not feeding him too much or too little. What else do you need to do in caring for a senior cat besides feeding him a healthy diet? In addition to making sure your senior cat’s nutritional needs are being met, you may need to make some other adjustments to his lifestyle. It’s a good idea, for example, to provide him with a comfortable but supportive cat bed so he can rest his weary joints. You might also need to make adjustments to make your cat furniture more accessible by adding steps or a ramp. Something else you need to keep an eye on with senior cats is dental health. By the time they reach three years of age, more than 50% of cats and dogs exhibit some degree of gum disease. It’s never too late to start taking care of your cat’s teeth, but it’s really something you should start when he is a kitten. If you haven’t been paying attention to your cat’s teeth, schedule a visit with your vet to see what kind of shape they are in and how you can keep them healthy. Aging is never easy but, with your help and a healthy diet, your senior cat can enjoy many more years by your side. Take advantage of every chance you have to spend time with him and heed the advice above to make the rest of his life as healthy and as comfortable as possible!